AUSTIN, Texas – Jan. 4, 2010 – Freescale Semiconductor has unveiled the future of the smartbook category with a tablet reference design featuring a 7-inch touch screen with up to four times the viewing area of a typical smartphone and based on a form factor that is approximately one-third the size and volume of today's typical netbook. The design is intended to enable a second generation of smartbook products with prices less than $200 and featuring form factors that fully leverage the power, performance and functionality advantages of advanced ARM® processor technology. It is designed to provide instant-on functionality, persistent connectivity and all-day battery life. The design will be demonstrated at the 2010 Consumer Electronics Show running both the Android and Linux® operating systems. The solution is based on Freescale's highly integrated 1GHz i.MX515 processor incorporating ARM Cortex™-A8 technology, and it also includes Freescale's MC13892 power management IC, SGTL5000 audio codec and the MMA8450Q 3-axis accelerometer. The solution is designed to help OEMs jump-start creation of smartbook tablets. End products based on the design could hit retail shelves as soon as the summer of 2010. 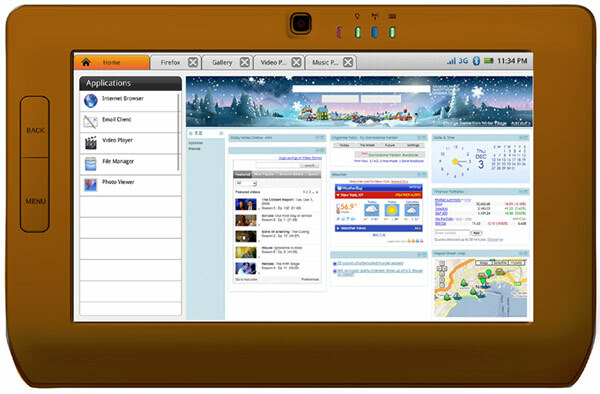 "Freescale's new tablet opens the door to an exciting new world of compelling form factors specifically designed and optimized to support common online activities including social media, high-quality audio/video playback and light gaming," said Henri Richard, senior vice president of Sales and Marketing for Freescale. "We believe the tablet will emerge as a popular form factor for the next generation of smartbooks. By introducing this prototype reference design, Freescale intends to play a vital role in propelling the mainstream adoption of smartbooks." The design is the first platform in Freescale's Smart Application Blueprint for Rapid Engineering (SABRE) series. The SABRE tablet platform for smartbooks incorporates feedback from of a recently completed end-user research study conducted in conjunction with Savannah College of Art and Design's prestigious Industrial Design program. "Semiconductor providers looking to differentiate in the nascent tablet market will need to offer solutions-focused system reference designs if they are to succeed with the world's foremost consumer electronics OEMs," said Jeff Orr, senior mobile devices analyst at ABI Research. "There is clearly strong end-user demand for tablet form-factors, and new reference designs look to play a major role in helping OEMs speed tablet smartbook products to market." The tablet includes Wi-Fi and Bluetooth® wireless connectivity, and also features a 3D desktop framework with touch screen/QWERTY keyboard support. 3G modem and RF4CE protocol options are available. The tablet's modular approach to 3G connectivity lets systems designers select carrier-specific air interfaces appropriate for different regions. Modules can be pre-certified by carriers and selected to match a range of features and performance ranges. This method makes it easy to migrate quickly to new modem technologies as they are introduced. Freescale and its partners offer a range of support, including turnkey designs. Inventec Appliance Corporation (IAC) provides expertise in design and manufacturing services for handhelds and netbooks. Freescale has also partnered with Thundersoft for software integration customization and optimization. For companies wishing to manage their projects internally, Freescale offers design aids including block diagram, schematic, list of materials and a Linux board support package. The smartbook reference design is expected to be available for evaluation beginning February 2010 through local Freescale sales representatives. Reference design details are available at www.freescale.com/smartbook.